This past weekend I took my beautiful friend, Jen from upstate NY, to one of my new favorite restaurants in Dallas: Neighborhood Services. I’ve dined at Neighborhood Services several times and am always impressed with the creativity of the chef & owner: Nick Badovinus. I’m a lover of brussel sprouts IF they are roasted in the oven. I do not care for the boiled to death green balls of bitterness. These were so fabulous and the entire table raved about how delicious they were. So I set off to recreate them as best as possible and they are almost as tasty as Nicks. Cut bacon into small dice – about 1/4 inch. Place in saute pan and cook over low heat. When crispy, drain bacon on paper towels set aside to cool. Keep bacon fat in saute pan for later. Boil pot of water. Drop in whole brussel sprouts for 2 minutes. Remove from pot and place into bowl of ice water. Cut brussel sprouts in half, and spread onto flat baking sheet. Drizzle olive oil and lightly salt. Place on high shelf in oven and broil for about 7- 10 minutes or until lightly blackened. In the saute pan with the remaining bacon fat, add 1 tbsp. of butter and melt over over medium heat. When melted, saute shallot until tender. Add maple syrup, brown sugar and apple cider vinegar and stir until slightly thickened. Toss in brussel sprouts and toss until coated. Looks amazing. I am a huge brussel sprouts lover and I think the ones at Neighborhood Services are the best I've ever had. I will have to try your recipe! 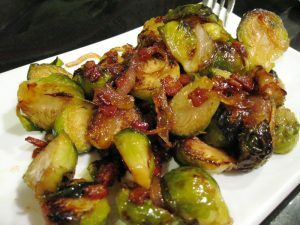 I have made this recipe three years in a row – I've converted more than one brussel sprout hater with it. Thank you so much for sharing, and for providing us with a new family favorite!